An ethanol production plant in Brazil. Photo by . Shell. While a debate continues about the future of biofuels, Brazil is currently facing an important decision for its own future. Ethanol from sugar cane emerged in the years 2000 as a potential alternative to fossil fuels and possibly a game-changer for Brazil’s national economy. The production of flex-fuel vehicles able to run on a blend of ethanol and gasoline increased considerably in the same years. But the situation as it stands today is not sustainable, due to low production: Brazil is not capable of exporting ethanol, and flex-fuel vehicles now predominantly run on gasoline without a drop of ethanol in the fuel. A lack of long term planning, petrol-dominated fuel markets, production decline resulting from the economic downturn, and global climate issues, have led Brazil into an ethanol crisis. However, a promising solution lies in delivering a package of incentives to the ethanol sector, which includes tax cuts and subsidized credit lines. 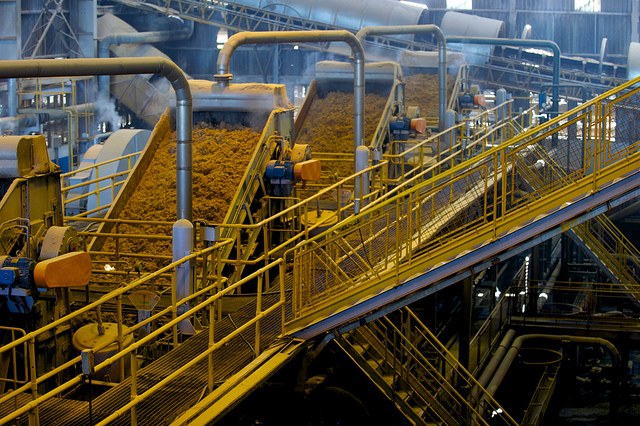 Manufacturers prefer to produce sugar, rather than ethanol, due to more attractive prices. And since the discovery of the oil-rich geological layer off Brazil’s coast, the global market for biofuels is no longer a priority. Brazil’s state-controlled oil giant Petrobras was the first company in the world to find and produce oil and gas under the salt layer at depths of up to 7,000 meters under the water line. New oil fields discoveries make Petrobras and Brazil top players on global oil and gas market. With the focus back on fossil fuels, ethanol remains in the backdrop. A survey developed by Itaú Bank Investments, the publicly traded bank headquartered in São Paulo, showed that in January of 2009, 80% of flex-fuel vehicles primarily consumed ethanol; but that number dropped to 27% by October 2012. Ethanol has also been lagging behind in the ranks because of government interference in the price of gasoline. From 2009 to 2012, ethanol consumption in Brazil declined from 17.9 billion liters to 11.3 billion liters annually; gasoline consumption, on the other hand, has only increased — rising from 25.4 billion liters to 39.7 billion liters consumed over the same time interval. The international financial crisis of 2008 also hit Brazil’s sugar mills hard. The crisis reduced credits and expanded planting costs, making sugarcane production more expensive. The crisis also reduced investments in the sector, including the investments from foreign capital, through companies such as BP, Shell, and Bunge, that started investing during the 2008 “peak” of the ethanol market. The sector has witnessed a systematic closure of sugar-mills. According to the Brazilian Sugar Cane Industry Association (UNICA), more than 40 sugar mills shut down from 2008 to 2012, 30 of which closed between 2011 and 2012 alone. Given this scenario, the Brazilian government released a package of measures last month to boost the sugarcane industry, which experts deemed an important encouragement yet too feeble to boost the sector. On the positive side, however, Brazil is looking forward to the opening of nine new ethanol plants in the next three years. Extreme weather conditions damaged the latest harvests of sugarcane over several years: one year was too dry; another, very rainy; and the third, in 2012, brought a frost that hit several plantations. Conditions such as these contributed to the rising cost of ethanol. Extreme weather events, sometimes downplayed, actually catalyzed the vicious cycle of the ethanol crisis. Aiming to increase the supply of ethanol in the country, the government announced in April a package of incentives to the sector, which included tax cuts and subsidized credit lines. The purpose of this package is to encourage producers to opt for the manufacture of fuel over sugar, whose prices in international markets are currently more attractive. With an increase in demand this year, the Brazilian government also expects a reduction in ethanol prices charged at the pump, which would enable ethanol to rise to a level playing field in the competition with gasoline. In addition, on May 1, the government implemented a mandatory increase in the proportion of ethanol in gasoline, from 20% to 25%. The increased proportion of ethanol in gasoline is not seen as an incentive for the industry, but as a benefit to Petrobras, which will need to import less gasoline to supply the domestic market. The outlook for the ethanol industry in Brazil is slowly improving, but the market still depends on the implementation of a consolidated national policy that prioritizes and stimulates the production and commercialization of ethanol and other biofuels currently manufactured in the country. As long as there remains no strong policy, ethanol will be treated with sporadic actions and will remain in the shadow of the oil industry. Where do you stand on the biofuels debate? Should we be concerned about ethanol’s overall environmental impact? Considering recent technological advances in diesel emissions reductions and second generation ethanol production, does Brazil have better alternatives?